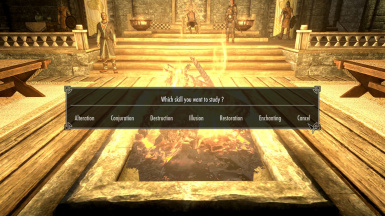 Anyone knows if this mod is compatible with Immersive College of Winterhold? Does the book appear in the Arcaneum? Edit: It works! It spawns on the ground near the center of the room. For some reason it also changes the Arcaneum's name to... German, I think? Easy to solve in Tes5Edit. This is such a fantastic idea. It's always bothered me that I can't simply study to get better at a certain school of magic. I like it a lot, except for the fact that stuff disappear after you use. You could make it so that it doesn't disappear, but rather become just "studied" and doesn't give any more bonus. Also, how about making the ingredients have something to do with the Schools being studied? Anyway, just ideas. It would make sense that you could keep your study notes even if they don't reveal anything more, any longer. Also it makes no sense why would the quill disappear. Maybe instead of a power you could make it so that you need to use a quill in order to activate crafting, but then you need paper and ink and other stuff to actually craft. You could also make a crafting recipe for making paper or papyrus, since it's so rare. It could also be that as you progress in the skill level, the level of the ingredients start to get pretty high. Or maybe you always need a quill, ink and some weird ingredient like a skulls, soul gems or whatnot... But you also need a spell tome (or more, for higher levels). 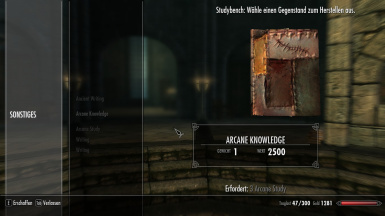 Make it so that the skill you have now and the level of the magics in the tomes you use interfere with the bonus in the final work of study. 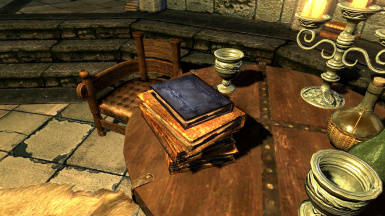 And again, the tomes would not vanish, but they would be marked as "studied" in a way that you can never use tomes of that spell in order to create more knowledge. So you would need to possess a certain amount of varied magic books in order to acquire a high level knowledge in a school. Which kinda makes sense. It would also be cool if you put a writing animation, like when you use the crafting for a blacksmith and there is the animation of hammering on the anvil and stuff. You can also integrate it with Living Takes Time and Realistic Needs and Diseases, which means that crafting the studies takes time and makes you hungy, thirsty and tired. Couple that with Winterhold College Days and voila... Ultimate Skyrim Mage Experience. 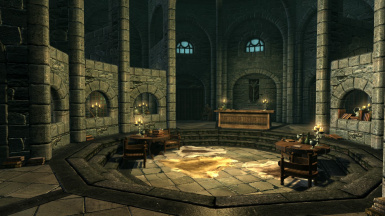 Heck, if you are using Skyrim Real Estate mod, you can be an adventurer the first few days of play in order to buy one or more inns and shops and then use your weekly earnings to go through Winterhold College Days and receiving education. I'm so friggin pumped up that it's almost a sin. Hey, great idea, It completely makes sense that a mage should be able to study and learn skills about magic!! Also I'm level 50ish and I only had a few of the required things because paper especially seems to be somewhat rare (although it is in the college archmage's room, and I think it re-spawns, I have yet to test that) so I think you balanced it nicely. Also wanted to say it works just fine with Sky-Re no patch needed because Sky-Re and Wrybash do the trick, anyone who uses Sky-Re (or requiem) I believe should be well familiar with the bashed patch and Re-Proccer. Another thing that makes complete sens, it is that train to concentrate magic in your hands would give you XP in the wanted magic school. Like Naruto learning the Rasengan for exemple, or Harry Potter and friends learnt to use their wands in school. In Skyrim, you can only kl bandits or deers to improve your magic skills, or summon some creatures. Same s*** for weapons I'd say, you cannot train on manekins, ok their are mods for that, but I think it would be cool to add some kind of concentration training improve the magic skills too. Just a suggestion. But like your idea mister cray, maybe mix the concentration training with writing the results to then improve the skills, well, these are ideas thrown like pens after a school test, yours to see if you those are good or not. Hey again, thanks for the suggestion! I definitely needed that mod too! 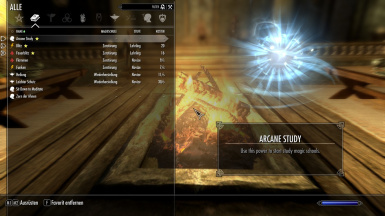 I too have wondered why the Dragonborn cannot learn magic by study as every other mage seems to, so this seems to me a very good idea. My one suggestion would be that you amend the skill gain for the arcane study simply because as it stands, you would get more benefit from using its crafting materials individually (3 ancient writing at 4 levels each amounts to 12 levels, 20% more than one arcane study at 10 levels) Apart from that, its seems like a very sound idea, though i also wonder whether the perk requirements might make it incompatible with PerMa or similar mods. thanks, the skill gain is a problem, i should really patch that. the perk requirements use the vanilla perks, maybe I can patch this to use the skill points instead of perks.